As we make our allegation about the latest episode of Battlefield Recovery thePipeLine will bypass the black comedy of some of the most inept dirt on shovel action ever seen in a television history documentary. We will also try to forget the casual racism in a finds analysis which suggested a set of human remains must be German because Russian Soldier would not have had such a good razor as his German counterpart [as any military historian knows, in the field soldiers are always “borrowing” other sides kit if it is better than theirs], and we will even look the other way and whistle so as to miss the potentially lethal practice of presenter Stephen Taylor dismantling a 20mm high explosive cannon shell by pulling it apart on camera and giving permission for another member of the “talent” [using that term loosely] to set fire to the propellant from the shell, also on camera. After all, we have already written at length about that particular on-screen shortlisting for a Darwin Award. Instead we will concentrate on what thePipeLine believes, on current evidence, is one of the most desperate edits ever made in an attempt to sanitise and spin a scene in a documentary which once had the word “Nazi” in the title. In the Spring of 2014 the channel which originally commissioned “Battlefield Recovery”, from London based ClearStory Ltd, the National Geographic Channel, part of the Fox network, launched a publicity campaign for the new series which was then called “Nazi War Diggers”. The series was accompanied by a promotional website complete with series background, cast biographies and visual material including, crucially, video clips taken from the series. 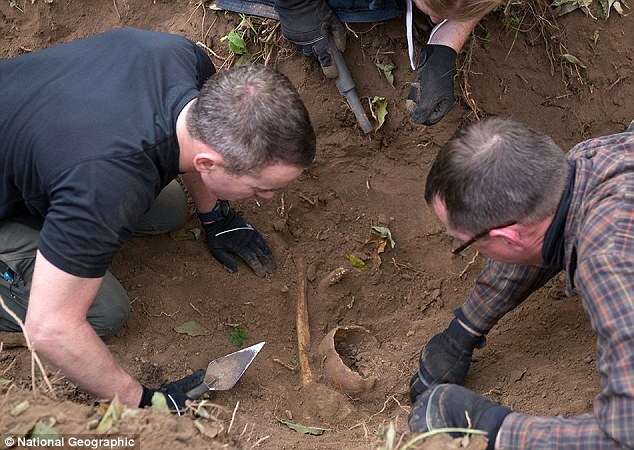 One video clip in particular caused outrage when it was highlighted by researchers Dr Sam Hardy , Paul Barford and others operating in the archaeological Social Media and that video happened to come from the scene which also formed the core of tonight’s episode of the re-titled and cosmetically enhanced programme; the digging up of the remains of someone who was probably a German Soldier killed in action during the heavy fighting outside the Latvian port of Liepaja during 1944/1945. Something was missing from episode two of the UK run of “Battlefield Recovery” besides archaeological ethics and methods- Got it, it was this shot of Craig Gottleib’s anatomy practical. In the original cut of the sequence published by National Geographic the following dialogue takes place as presenter and dealer in Nazi era militaria, Craig Gottlieb, apparently taking instructions primarily from Stephen Taylor, wrestles a human long bone from the ground, possibly breaking it, and then holds it up to his shoulder. Taylor: So that’s his shoulder. Gottlieb: I think that’s his leg. However, in the edit shown in Poland and the UK, the excavation of the long bone by Craig Gottlieb jump cuts from Gottlieb apparently removing the bone from the ground to his holding a damaged femur against his leg with the following shorter dialogue. Much of Gottleibs crude attempt to remove the bone from the earth and Taylor’s misidentification is omitted completely. The effect of this is to keep from the audience the full crudeness of the digging and most importantly, the demonstrable lack of knowledge of the presenters when it comes to the sensitive task of excavating human remains. Taylor, Gottlieb and Co might be able to tell the difference between a German 7.92 Mauser and a Russian pistol round from a PPSh, but when it comes to telling their arm bone from their leg bone, they are found woefully wanting. It is probably fortunate they are not asked to tell the difference between their archaeological arses and militaria collecting elbows as on the evidence of this display they would probably have a problem with that too. For the TV regulators such as Ofcom there are a number of ways of describing what ClearStory did in denying the Channel 5 audience the full version of the scene which National Geographic once deemed appropriate to promote the series by placing the full version on line so anyone could watch Mr Gottlieb and Mr Taylor’s masterclass in forensic anthropology as often as they wanted. The most famous way of describing this kind of sleight of hand is the phrase used by former Cabinet Secretary, Sir Robert Armstrong’s during the Peter Wright trail, that is that the scene is “Economical with the truth”. But that is to imply interpreting “Battlefield Recovery” is some battle of intellectual wits played between equals rather than archaeological “Whack-A-Mole”. Instead, many might argue that the most succinct and accurate description of what ClearStory did in the editing suite and what Channel 5 broadcast, is a visual lie; making the presenters look more competent, or at least less incompetent, than they actually were. In other words, by that interpretation, far from watching a documentary, the audience were actually watching ClearStory cynically trying to spin themselves out of the trouble the full version of the scene had caused them when it was first shown. This is because by removing parts of the sequence which had previously been shown, but which were utterly crass and demonstrated beyond dispute just how incompetent the presenters were at what they were tasked to do, ClearStory also avoid the question which goes begging when you watch the full version of the sequence [as well as most of the rest of the programme] and that is why did anyone at ClearStory ever think it was appropriate to place Gottleib, Taylor and Co in the position of digging up human remains and ammunition on camera in the first place? Summing up; a case can be made that ClearStory have made a sequence which is perniciously misleading and which can reasonably be assumed to have been designed to avoid or deflect the criticism the scene attracted in 2014 when it was placed on-line by National Geographic. Criticism which got the show pulled by the network. A move which must have cost ClearStory dearly both in terms of reputation and financially and which they literally could not afford to see repeated. Thus far the strategy has worked. Although forced to beat a retreat from Australia and New Zealand when Battlefield Recovery was cancelled barely twenty four hours before it was due to air after an outcry from the archaeological community, the UK is now half way through the scheduled run of four episodes and it worth assessing where both critics and the series stand. Looking at the production now, so over the top, and cliche ridden and darkly funny are parts of “Battlefield Recovery” that in many respects the series comes across as something like Mackenzie Crook’s award winning touchy feely, rural idyll “Detectorists” re-imagined in a dark mirror by Charlie Brooker assisted by Armando Ianucci of “The Thick of It” and “In the Loop” fame. Yes Kris, that is probably because addicted to bleeps you are so lamming into the ground with a backhoe, operated by a blameless driver who you and the other three Minelab minions can’t seem to communicate with, and digging human burials with gardening tools does rather mitigate against understanding the archaeology. Meanwhile Stephen Taylor would probably still be saying he was surprised seventy year old munitions still “had some bang in them” on the day he, or one of his other militaria digging chums “jumps 200 feet in the air and scatters themselves over a wide area” Blackadder style, while digging up potentially live explosive devices, taking them apart and setting fire to the propellant charge as a jolly jape. In which case, if ClearStory Productions, its Public Relations Company, Plank PR, and Channel 5 Televison, can provide incontrovertible video, or written evidence that any of the suggestions above, or those we have published previously in thePipeLine, are not true, and publish the paperwork demonstrating that the team had licences and permits for absolutely all the activities they are seen to undertake in “Battlefield Recovery”, the PipeLine will publish that evidence in full and apologise with the same prominence as this article and the others we have published. Or ClearStory could display the honesty and human decency which the presentation of “Battlefield Recovery” has lacked until now; admit you have been found out; admit that only five objects were preserved in the Latvian War Museum [and tell us what happened to the rest]; admit that your team were involved in dangerous and potentially lethal practices on camera and then withdraw the series, permanently. And if the DVD “Battlefield Recovery” sits on is re-recordable Channel 5 could always re-cycle it as something socially responsible and useful, like a coaster, or record over it with more close ups of the grieving Angie Bowie in “Celebrity Big Brother”. ClearStory and Channel 5, thePipeLine is waiting for your reaction. The Archaeological World which is in uproar over the way the series presented battlefield investigations and the treatment of the remains of human beings in a way which managed to be unethical, dangerous and boring, is also waiting for your reaction. Many veterans, veterans groups and those who support them will also be waiting for you to do the decent thing. Even many individual metal detectorists may be horrified at the damage this series is doing to the image of their hobby and will fear it will bring fresh calls for metal detecting to be licenced and the reporting of finds to be made compulsory. Most importantly, also waiting are the families of the missing who, thanks to the cynical, crass, incompetent and exploitative way you made your programme can now never have a positive identification of their loved one when, had the excavations your four amateur presenters bungled and bodged been undertaken forensically, as advised by the archaeologists you consulted and then ignored, they might have.